Welcome to Found Off The Street, our look at cars found on the cape that rust liked so much it decided to summer there; Cape Cod, MA. Today we have a 1975 Ford Torino wagon. Last week's 1977 Volkswagen Beetle was an oddball project car waiting for the right person to come along and bring it back to life. Although this week's 1975 Ford Torino wagon never quite made it to project car status, the old wagon was showing its age before it was purchased by its current owner. As you can see this low mileage Malaise era oddball is looking better than most 36 year old wagons these days. The allure of a station wagon to many car lover is as hard to explain as it is undeniable. Station wagons are cool. Beyond the fact they are relics of an era before watered down SUVs, minivans and crossovers were the family car of choice, they are an increasingly rare breed in modern times. Fewer and fewer car makers offer a classic station wagon with each passing year. Vintage station wagons are a fairly rare breed as well, although for different reasons. It wasn't the fact they didn't make enough station wagons in the '50s, '60s, '70s and '80s, but due to years of use as they were intended few survived. Little thought was ever given to the future collectibility of a station wagon, and most were sent to the junkyard or the demolition derby at the end of their usable life. Few station wagons experienced the pampering and preservation usually reserved for more desirable automobiles. With that being said, well taken care of low mileage station wagons can be found. Underneath some modifications, that is exactly what this week's FOTS 1975 Ford Torino is. This Torino has only traveled 44,000 miles in its 36 years, likely one of the reasons this 70s wagon managed to survive, when so many of its kind didn't. The Torino has only changed hands three times in its life, spending most of its life in New Jersey before it was brought to the cape that rust remembered in 2006. Even though it wasn't a New England native, this low mileage wagon had enough rust on its body when it arrived to fit right in with many of the other old cars in the area. 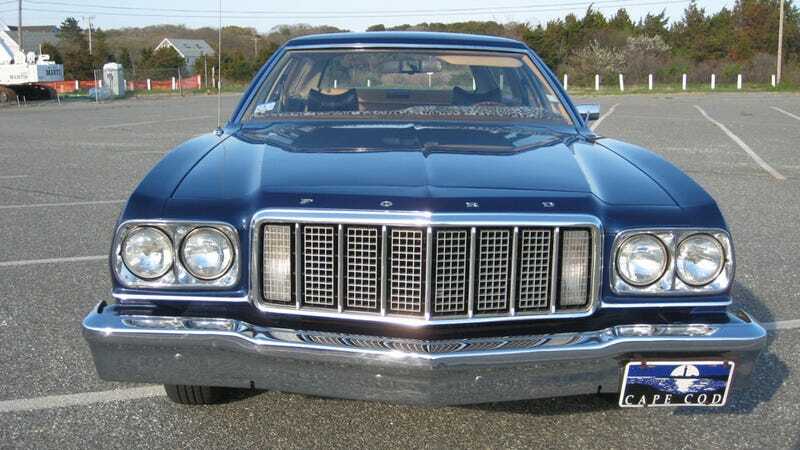 As you can see, since the Torino's relocation to the cape that rust remembered the car has been repainted, replacing rusty body panels and a very Malaise brown paintjob with clean sheet metal and a deep blue exterior. The Mercedes bucket seats and leopard print dash cover installed by the previous owner have remained with the car and only add to the quirkiness of the car. Although the Malaise is strong with this old wagon, from its extended bumpers to its emissions choked 351 Modified, it's unique charm is hard to deny. If it sounds like I know this car a little bit better than most Found Off The Street cars, it is because I do. Automotive obsession is often passed from generation to generation and my own family is no different, the Torino wagon shown here belongs to my very wonderful and very automotive obsessed mother. The amazing woman who has always inspired and encouraged my love of automobiles splits her time cruising the streets of the cape that rust remembered between this wagon and a few other slightly less odd old cars. To her and all of the other Jalop mothers, car obsessed or otherwise, I wish a very Happy Mothers Day.